RHS exhibition results 3 weeks today! 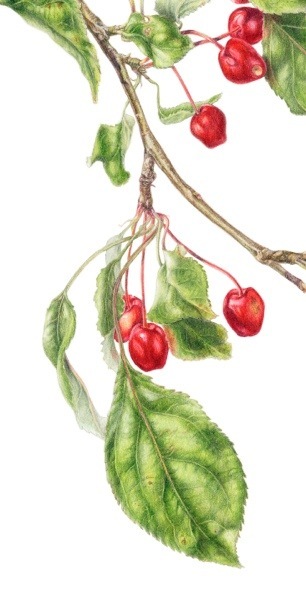 In three weeks time, on April 10 about midday I will know if my six botanical art paintings in coloured pencil have passed muster and if they have won a medal. I’m still hard at working up the colours in Photoshop and In between teaching classes, workshops or marking botanical art assignments for the London Art College. The days are long, but it sounds as though it is going to get colder again and the weeds in the garden might grow slowly for a short while. The Magnolia is in full and splendid bloom; several weeks early according to pictures taken other years. Each of the crabapple trees have started sprouting. I now have seven different ones. Would you like another glimpse from the Malus. Red Jade picture? This time it’s the apples. The full picture with dissections is quite interesting, but you will have to come to the RHS exhibition to see it. Thank you so much. It really helps when you know that people want you to do well.